The Bílá Ruže Hotel Brno is situated one kilometer away from the historical center of the city. Guests will find that the hotel is located near the exhibition grounds as well as Luzanky Park. This accommodation in Brno is also situated near the T G Masaryk Racetrack as well as the Old Town district. 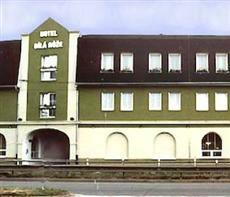 The Bílá Ruže Hotel Brno is located 4 kilometers away from the Brno airport. The railway station is located a kilometer away, and guests will find the main bus station within 500 kilometers. Each of the guestrooms at the Bílá Ruže Hotel Brno is budget friendly and well designed. All rooms include an array of amenities designed for leisure and business travelers alike. Private bathrooms can be found in each guestroom at this hotel. Guests of the Bílá Ruže Hotel Brno will find that the hotel offers travelers convenient access to many Brno shops and restaurants. The hotel offers a restaurant onsite as well. There is also a bar onsite as well as a terrace.